I don’t know what this guy is smoking. The book covers the basics, as a book like this must, but there is so much more. If anything, there is too much information, especially for newbies. My guess is Mr. Anonymous didn’t read past the introduction or first chapter. Right or wrong, that’s his opinion. What can I do about it? You reach out to your clients and ask them to post a review on the site. Most will leave you good reviews, right? As new reviews come in, the stinker will move down and eventually off the page. If a prospective client does see it, he will also see that it is one bad apple in a big barrel of satisfied clients. Will you help me? If you read the book, would you please leave a review. Just a line or two is fine. I would appreciate it. You can do that on this page. If you don’t have the book, you can check it out here. One more thing. Amazon allows people to vote on which reviews are “helpful” and which are not. If you believe the book is good and not “too basic,” please vote down Mr. Antonymous’ review. Thanks again for you help. I’m looking forward to reading your review. If you’re a proponent of David Allen’s Getting Things Done (GTD) productivity system like I am, you’ve probably tried numerous ways to incorporate it into your work flow, from paper and file folders to web and mobile apps, and everything in between. Many of these are complicated, with lots of bells and whistles and a steep learning curve. Others, like plain paper or a Moleskine notebook are simple but for many of us, too limited. I’d been using Evernote for a long time, first for collecting information and ideas, eventually, for all of my documents. One day, I decided to see if I could also use it to manage my tasks and projects. Although Evernote isn’t designed as a task management application and it is limited in that realm, I found a way to make it work for me, and today I use it every day for exactly that purpose. I like having one app for almost everything I do. I like having all of my notes and documents in the same place as my tasks and projects. It’s simple, reliable, and flexible and provides me with a complete system for managing my work and my life. 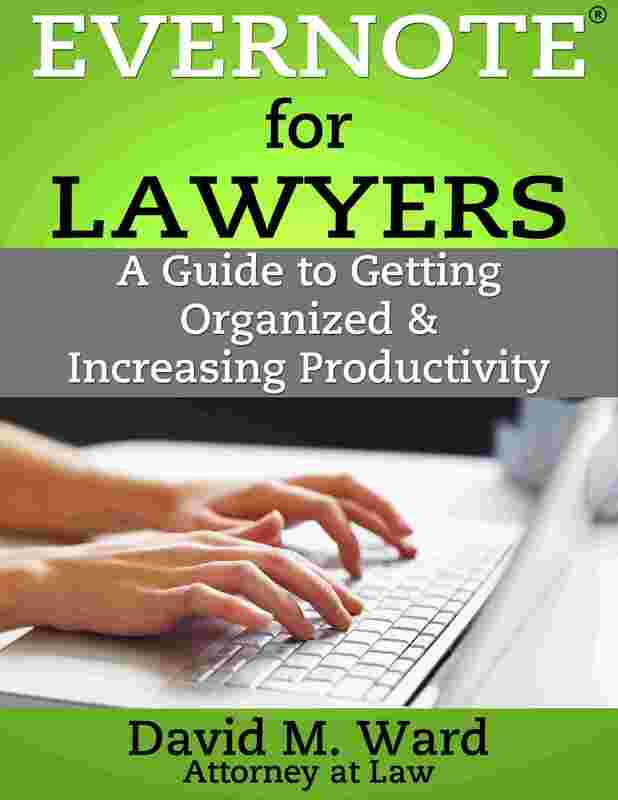 I went looking for others who use Evernote for Getting Things Done, and my search led me to fellow attorney and blogger, Dan Gold. Dan is a maven in the world of technology and productivity and has tried just about every productivity app under the sun. He used Evernote like I did, for collecting information, but was unable to find the right way to use it for GTD. In his quest to achieve a “mind like water,” he finally found the right combination. The story of his journey is told in his newly published ebook, “Evernote: The Unofficial Guide To Capturing Everything And Getting Things Done,” (aff. link) now featured in Evernote’s Trunk (store). It’s a great read and provides a much needed lesson for using an extraordinary piece of technology in conjunction with a seminal productivity system, to manage your work and your life. I read the book and found that to a great extent, Dan’s journey paralleled my own. We both liked the power and ubiquity of Evernote but were frustrated with its limitations as a productivity tool. After trying various apps and workarounds, we eventually found the solution. In his book, Dan credits my blog post about how I use Evernote for GTD (and another blogger’s post on that subject) with providing some of the missing pieces in his set up. I appreciate his saying so but in reality, Dan had most of the pieces already in place. Like I had, he was adding elements–other apps that integrate with Evernote and a more complex arrangement of notebooks and tags. My post and the other blogger he credits simply showed him that Evernote didn’t need anything else, it could be used “as is” for GTD. The key is not adding elements but subtracting them. Not using more notebooks to organize everything but fewer, and using enough tags, but not too many, to manage everything. 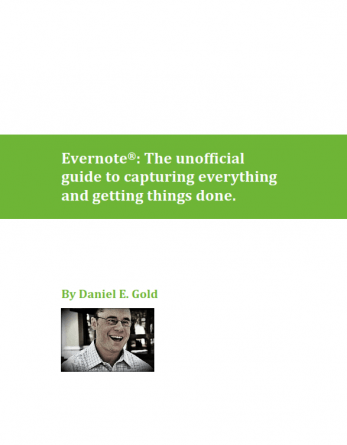 If you are a newcomer to Evernote or GTD, Dan’s book will sell you on why you need to be using them; it won’t tell you everything you need to know about how. What it will do is show you how you can use them together to create a complete system for getting things done. “Evernote: The Unofficial Guide To Capturing Everything And Getting Things Done,” is a quick read and available for immediate download for just $5. Dan promises free updates and since Evernote is continually being developed, this makes a great value even greater. 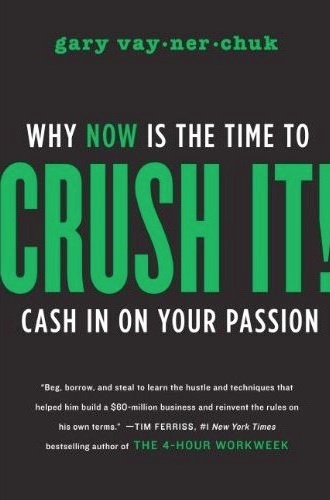 I wrote this brief review of “Crush It!” by Gary Vaynerchuck on another blog more than a year ago. My knowledge and use of social media has come a long way since then. I’ll post reviews of other books I’ve read that have more of the “how to’s” but this is the book to read if you want to know “why to”. I’d heard a lot of good things about “Crush It!” and finally downloaded it (kindle for PC, in case you’re curious). I’m fairly new to the world of social media marketing so I was surprised at how much I already knew and how much I was already doing. After reading Crush It!, I now know (a) social media marketing is not a passing fad, (b) properly implemented, it’s an incredibly powerful way to build almost any kind of business, and (c) it’s not that complicated. In other words, if you market something on the Internet, or you want to, you need to add social media marketing to your marketing mix and it’s a lot easier than you may have thought. Now, if you’re looking for a detailed manifesto on social media marketing, this isn’t it. It’s a great story and a compelling look at the power of social media marketing and worth it for that alone. Where it really shines, however, is in driving home the importance of finding your passion, your DNA as Vaynerchuk calls it, and building your brand, and your business, around that. Vaynerchuk makes you think about who you are and what drives you. If you’re going to “crush” anything, it’s going to have to be something you are passionate about, or you won’t do it enough, or well enough, to cut through the noise and clutter that competes for the eyes and ears of your target market. If you don’t enjoy what you’re doing, you aren’t going to make it; if you do, the journey will be as rewarding as the destination. A friend of mine often says, “if you do what you love and you love what you do, you’ll never work another day in your life.” No doubt Gary Vaynerchuk would agree. Another book, based on a groundbreaking study by famous psychologist, Walter Mischel, presents a different perspective and an actual way to predict success. “Don’t Eat The Marshmallow Yet,” describes a study of a group of four year olds who were presented with a marshmallow. They were told if they could wait 20 minutes before eating it, they would get a second marshmallow, but if they eat it now, it would be the only marshmallow they get. Some kids were able to wait, others couldn’t resist. The researchers studied the kids for many years after the initial experiment and found that the kids who were able to delay their gratification and wait 20 minutes to get a second marshmallow were much more successful in all areas of their life. The differences in results as the kids grew older were startling. The ones who could delay gratification had better social lives, were more intellectual, better off financially, and happier. So if success comes from doing what you want (and avoiding what you don’t) and what you want is to eat the marshmallow now (and not wait 20 minutes), don’t these two conclusions contradict each other? I define success in terms of happiness; the happier you are, the more successful you are. When you know you are on the right path, doing what you enjoy, going where you want to go, you are happy, even though you are not yet experiencing all of the fruits of your labor. In fact, I would argue that delaying gratification actually enhances your joy because success isn’t in the destination, it’s in the journey. When you imagine what your life will be like a few years from now and the picture in your mind is pleasurable, you can be just as happy now imagining your future as you will be when that future arrives. So they are both right. In doing what you want to do you enjoy the present and you are also excited about the future. You don’t mind waiting for that future to come because you know it’s coming (and you enjoy thinking about that) and, more importantly, you’re having fun right now. Steve Jobs’ abrupt resignation yesterday had social media buzzing about the news and what it means for Apple (which saw its stock immediately drop, and then rebound) and for the tech world. Every news channel and blog had something to say and the tweets and wall posts abounded. But what does his resignation mean for attorneys? How will this affect your law practice? Well, unless you work for Apple or one of their affiliates, it won’t affect your practice at all. So. . . why the tease? Was my headline a gimmick to get more clicks? It’s true that I don’t have anything to say about how this news story will actually affect your practice, and while that smacks of gimmickry, there is a lesson in this. “If a subject is exposed to something related to your idea before he actually encounters your idea, he’ll be more sensitive to it, and this makes it easier to catch his attention. . . .
And so, primed as you were by the news of Jobs’ resignation, you were more inclined to click through to read this story. Yes, I cheated a bit with my headline and yes, it would have been better if I had something to say about how the resignation affected the legal profession, but then this would have been a very different blog post. Zarrella also says that people share on social media not for altruistic reasons but because the information they share reinforces their reputation. People prefer to share breaking news, for example, because it is scarce, rather than humor or opinion which is all too common. So, not a new concept. What’s new is that now, social media metrics let us quantify what we always suspected, while leading us to discover ideas that never crossed our minds. Zarrella’s book is also free, through August 27. “Writing is thinking on paper,” said William Zinsser. As someone who does a lot of thinking and a lot of writing, I have to agree. Years ago, I read an ode to writers and would-be writers, “Writing Down the Bones: Freeing the Writer Within,” by Natalie Goldberg. If you love writing–or want to–this book can help you overcome doubt and unshackle your hidden talent. It was in this book I first learned about “free writing,” a technique for writing quickly, without editing or a hint of self-consciousness. 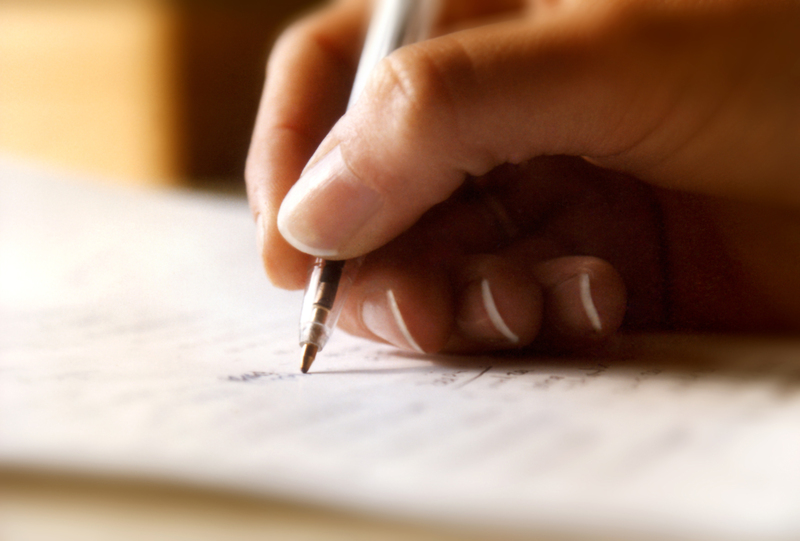 Free writing is raw and uninhibited, allowing you to find out what you think, and what you feel. Goldberg describes it as “writing practice,” a warm up before getting down to “serious” writing and a way to create raw material that can be cultivated into finished work. For some, free writing is a cure for “writers’ block”; for others, it is a form of therapeutic journaling, unlocking hidden memories, imagining a better future, or reconciling a troubled past. For me, it was the key to becoming a better writer and a better attorney. As a young attorney, I wrote in a way that could only be described as “constipated”. My writing was clear, my points well thought out, my letters and pleadings effective, but I still wrote “like a lawyer”–stiff and constrained. Free writing helped me stop trying to sound “professional” and start sounding like myself. My writing came alive and in a way, so did I. Free writing helped me not only to write better but to get clear on what I wanted and what I could do. It helped brainstorm ideas and simultaneously see what I thought about those ideas. It helped me weigh pros and cons and make better decisions. In short, it helped me to think better. As Goldberg does in “Bones,” Levy uses a series of writing exercises that stimulate thought, but more importantly, action–the action of writing. In free writing, quantity produces quality and writing exercises get the hand moving and keep it moving long enough to bypass the critical mind and produce meaningful results. It may be because I was at a different place in my life when I read “Bones”. I haven’t read it in years but I still remember how it made me feel. Goldberg’s voice was comforting, warm and empowering. And, she got my hand moving. Her exercises were simple and unstructured and I did them all. I wrote and wrote and wrote and I felt good about it. I never once looked over my shoulder to make sure I was doing it right and that, of course, is the point of free writing: letting it happen rather than making it happen. Levy references several books about free writing (I’ve read most of them); curiously, he never mentions, “Writing Down the Bones,” the book that introduced me to free writing and helped me discover my “accidental genius”. In my view, “Bones” is a seminal work, one I’m sure he’s familiar with, and I was surprised by its omission. Perhaps I’m just being nostalgic and if I read “Bones” today, as the person I am today, I would see it as more suited for writers than professionals and look for something else. Nah, I’d probably be too busy writing to give it any thought. 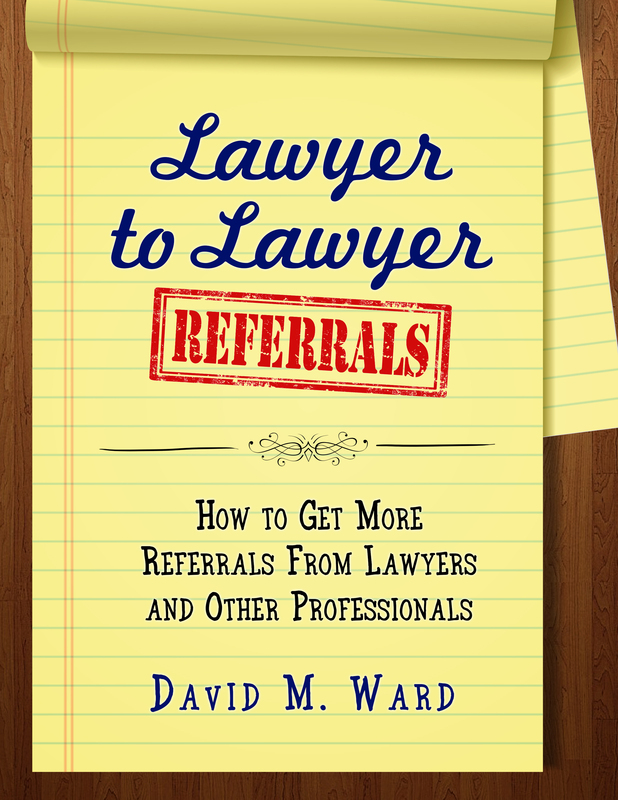 The ABA Journal published a list of books lawyers said they would recommend to other lawyers. So I have some questions for you. My answers are in parentheses. How many of these books have you read? (Two). What books are missing from this list? (Anything by Earle Stanley Gardner (Perry Mason); his stories were part of the reason I became a lawyer. Also, To Kill a Mockingbird, also suggested by others. Also, see question number 4 below). Why are so many of the books on this list so. . . heavy-duty? (It’s the ABA). 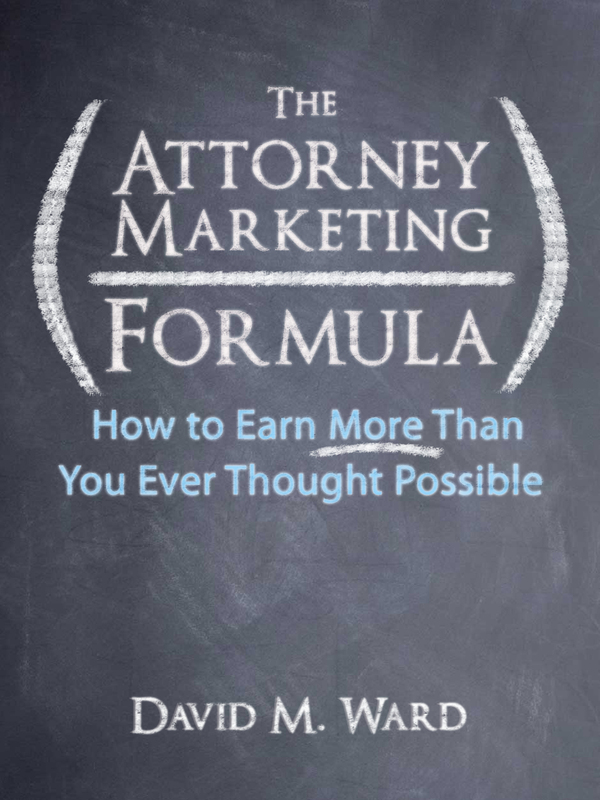 Why are there no books on marketing or making a living as an attorney? (It’s the ABA). In my opinion, this is a list of books one might recommend to someone thinking of becoming a lawyer, not a list for lawyers. We already drank the Koolaid; give us something to read that will make us happy we did. A few years ago, I didn’t know the difference between leadership and management, and, frankly, I didn’t care. To my way of thinking, these were "corporate" concepts, irrelevant to my needs as a sole practitioner trying to build a law practice. In my never-ending quest for personal development, I have since learned a great deal about these subjects and now appreciate their value in building a law practice. If you would like a shortcut to understanding the essence of these subjects, I’d recommend a book by Marcus Buckingham, author of the best sellers, "First, Break All The Rules" and "Now, Discover Your Strengths. Buckingham’s latest is "The One Thing You Need to Know. 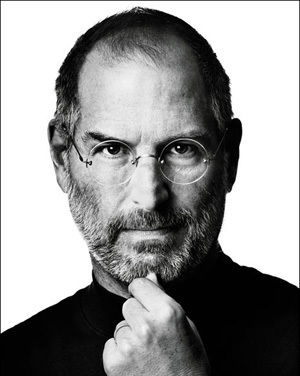 . . About Great Managing, Great Leading, and Sustained Individual Success." His insights on leadership and management will truly help you become more effective in managing your practice. His conclusions about "sustained individual success" will not only help you attract more clients and increase your income, they will help you enjoy the process. Success and happiness. Not a bad combination. 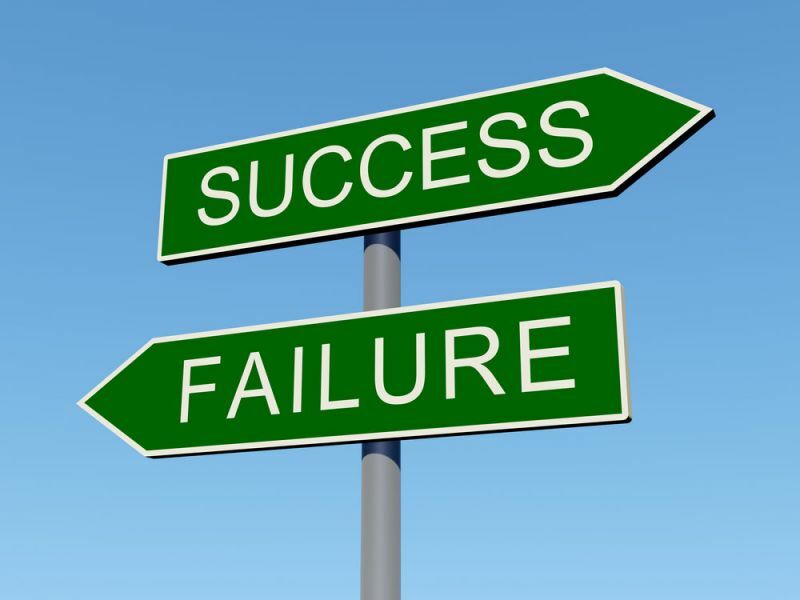 I agree with Buckingham’s conclusion that success does not require (and may actually be inhibited by) balance, a conclusion supported by another book I recommended and frequently refer to, "The 80/20 Principle" by Richard Koch. Yes, we want balance between our careers and personal lives, but when it comes to marketing a law practice or building a career, I have always counseled an unbalanced (focused) approach: specialization, niche marketing, and maximizing strengths while making weaknesses irrelevant. So when people say I’m unbalanced, that’s a good thing. 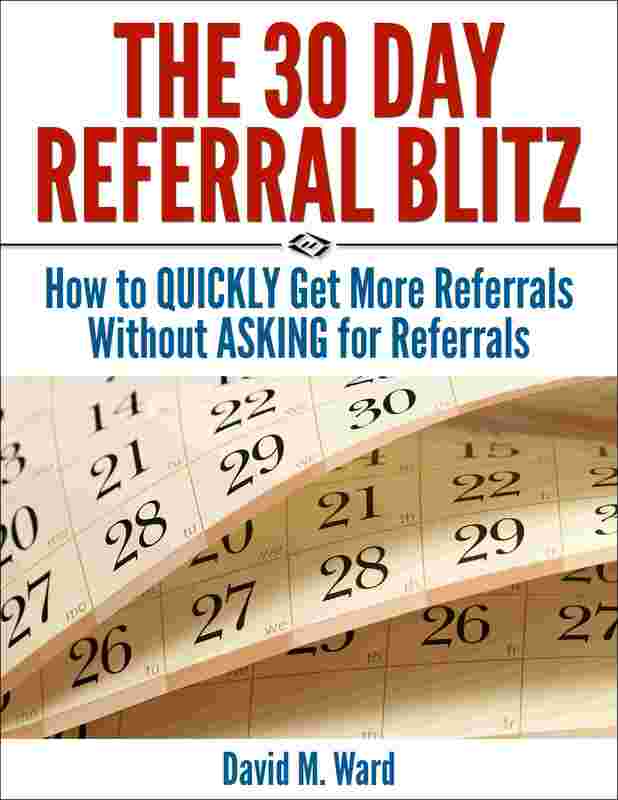 “The 30-second rule”: more clients and better verdicts? In a recent post, How to make people like you, I said that a positive attitude is a key to getting people to like you, especially when dealing with people facing stressful situations. Being liked may not be first on the list of traits you associate with success in the legal field, but countless studies demonstrate that people prefer to do business with people they know, like, and trust. 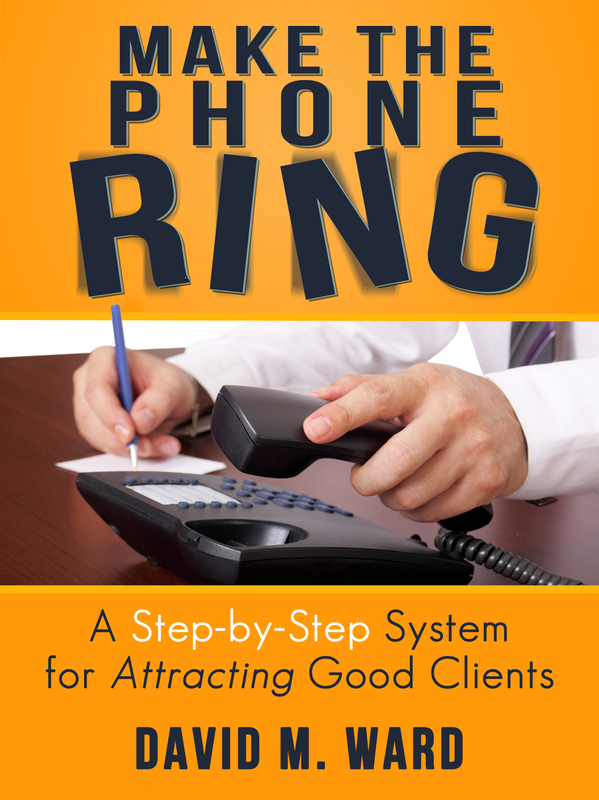 All things being equal, clients will choose you and referral sources will refer to you, because they like you. Let’s face it, even litigators benefit when juries, judges, adjusters, and opposing counsel like them. Books like The Likeability Factor: How to Boost Your L-Factor and Achieve Your Life’s Dreams by Tim Sanders and 25 Ways to Win With People:How to Make Others Feel Like a Million Bucks by John C. Maxwell and Les Parrott substantiate this and offer specific strategies for achieving greater likability. Maxwell and Parrott say the way to make people like you is to make them feel good about themselves when they are with you. One way to do that is with something Maxwell calls, "The 30-Second Rule: within the first thirty seconds of a conversation, say something encouraging to a person." Maxwell learned this from his father who taught him that when you make contact with people, instead of focusing on yourself, search for ways to make them look good. It could be saying thank you for something they have done for you or someone you know. You might praise them on an accomplishment, or offer a word of encouragement as they work towards a goal. Or you might simply compliment their appearance. Maxwell encourages us to ask ourselves, "What positive, enouraging thing can I say to each person I will see today?" With whom is your next appointment? Who will you be speaking with later today? Think about what you could say to them that will make them feel good about themselves, and say it. This may feel uncomfortable, at first, but give it a try. What might surprise you is how good you feel making others feel good about themselves. If you’re interested in marketing your law practice online (and you should be) there are two resources I want to recommend. The first is a new book, "The New Rules of Marketing & PR" by David Meerman Scott. The sub-title is, "How to use news releases, blogs, podcasting, viral marketing & online media to reach buyers directly." That about says it all. I’ve just started reading it and can tell you, it’s excellent. Highly recommended. 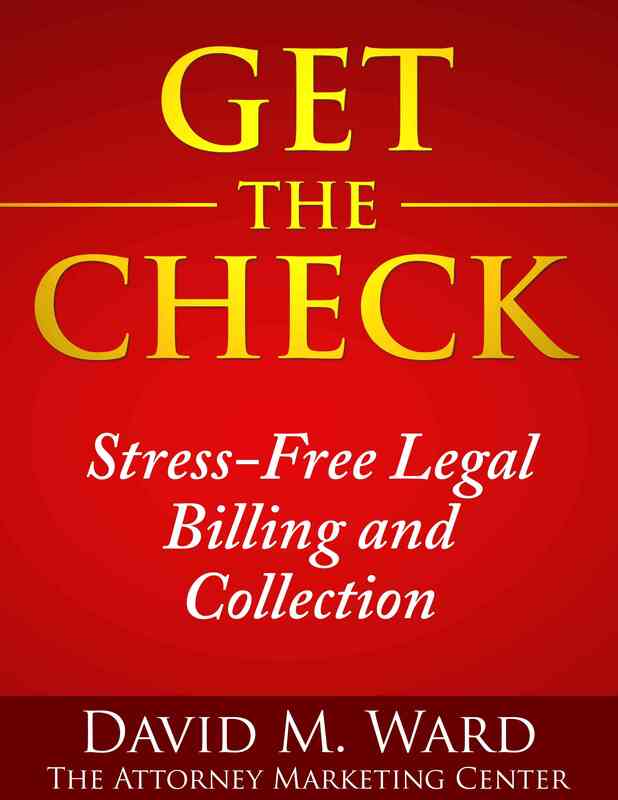 The other resource is a free ebook from consultant Brandon Cornet at websmartlawyer.com. It covers web sites, blogging, search engines, lead generation, and has links to oodles of resources. Valuable stuff. Cornet’s ebook is itself a fine example of viral online marketing, in that it is a free download from his web site (you don’t even need to supply an email address to get it), coupled with good content that demonstrates his knowledge and experience. Sure enough, here I am "distributing" it to you, and thus, this strategy could quickly generate hundreds of qualified leads for Cornet’s consulting services. It illustrates another key marketing concept, niche marketing. Cornet could hold himself out as, simply, an Internet/website consultant, hoping to appeal to "everyone" but, like so many others, he would find his voice drowned out by his many competitors. Instead, by targeting lawyers, he narrows his focus, which should make it easier to both generate leads and close them, since clients (and that includes lawyers) prefer specialists. Both books agree, the Internet has forever changed the rules of marketing. Those who ignore this, do so at their peril.